What a great way to greet the Tennessee Agricultural Greenhouse inspector - a crop of Aphids! I had an infection of the little varmints a month or so ago but thought I had gotten rid of them. 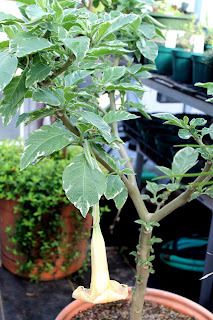 This Brugmansia was the culprit the first time but it was Aphid free at the time of my inspection. In the mean time I had taken in a few plants that belonged to my neighbor who was going to Florida for an extended vacation. He talked me into feeding a stray cat and the birds at his house too. Quite honestly, I didn't think the too were compatible but I'm a softy for critters so I agreed. That was before I knew he was leaving for six weeks! My Creeping Rosemary had been looking a little creepy and not in a good way. I showed it to the inspector and he looked at it through his magnifying glass and there they were; three stages of Aphids on one leaf alone! Not only on the Rosemary but Hibiscus (above) and Golden Oregano (left) had them too. He then checked out the plants from my neighbor. You guessed it. 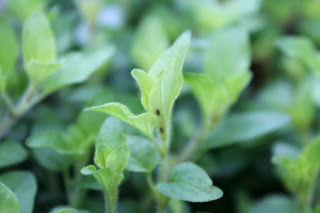 They were covered with tiny Aphids. 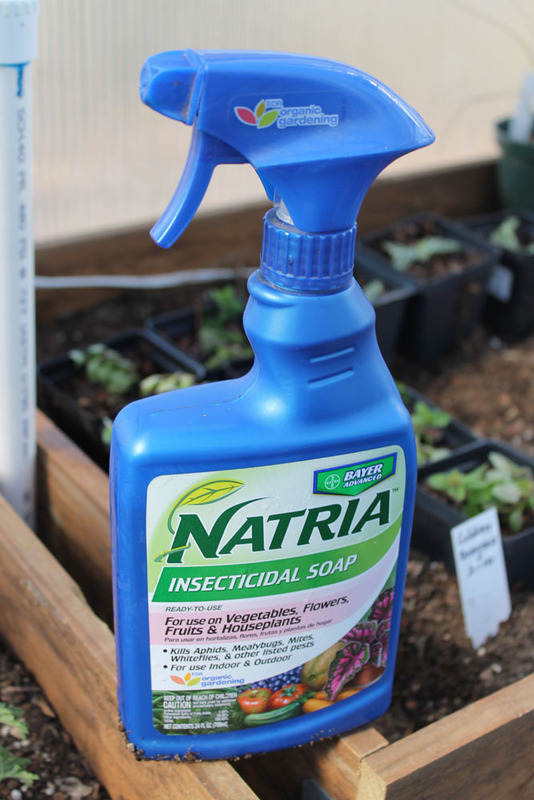 He gave me a lecture about never, ever taking in plants from out side without at the very least spraying safer soap on them. He said he would never allow plants into his greenhouse that he didn't grow himself or receive from a certified site. Lesson learned the hard way. I immediately took my neighbors plants outside and far away from the greenhouse. I sprayed them but will not put them back inside. Next the Rosemary was soaped down and moved outside. We still have a chance of cold weather but they will be OK. The Hibiscus and Oregano will have to stay in but they got a drenching top and bottom with Safer soap too. 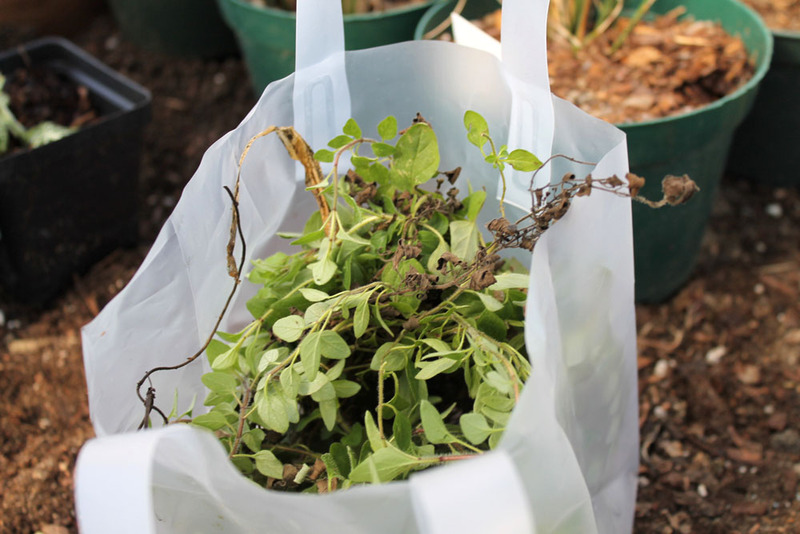 I cleaned out all damaged leaves and stems and put them in a covered trash container - no compost for these. I will continue to keep an eye on my plants. Yes, I brought my magnifying glass to the greenhouse. I will repeat the Safer Soap spray weekly until no sign of the pests remain. BTW: I did pass inspection but he wants to inspect again before my first plant sale in May. Of course we all know this but his parting words were good advice to always remember, "Don't put anything out there for sale that you would not purchase yourself." and I would add, "Resist being a good Samaritan and baby-sitting your neighbors plants".